This is episode 11 and today we discuss the best use cases of chatbots and go into specifics of Messenger bots for Shopify stores. 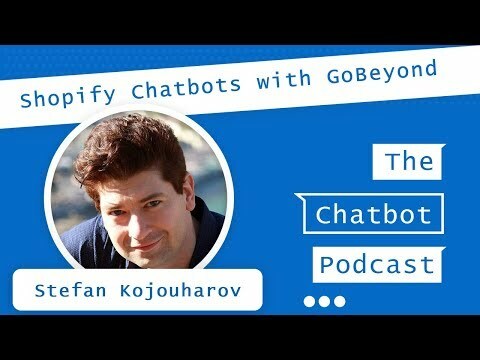 My guest is Stefan Kojouharov the founder of Chatbots Life and founder of Gobeyond.ai a software dedicated to helping with your Shopify store when it comes to Messenger marketing. Gobeyond can be connected to Chatfuel, one of the most powerful bot builders out there. Just a quick note, we pay a Chatfuel Pro account for our students and you can still join Chatbot Tutorial PRO for an early bird price. Just visit chatbottutorial.com/pro for details. Fortunately, Stefan agreed to come back at a later point for more discussion as the technology evolves. Feel free to send us questions in advance here. We pay both Chatfuel PRO and Janis Pro for our students in the Chatbot Tutorial PRO mastermind. Learn more about how you can receive this amazing bundle of software and education right here.